Have you wondered what it's like to be a pig at our ranch? It’s no secret, pigs don’t always get the prize for having a picture perfect home in our eyes. They like things a little stirred up! While I’ve probably not been a pig in a former life, and it’s not on my top “want to be” list, only a very small percentage of pigs in our great country get to live outside and be a pig! So, IF i had to choose, this is definitely the way I’d choose my life as a pig to be. Pigs at our ranch have mud, grass, roots, and so much to do, and delicious food to eat, that they simply love to nestle in a pile and sleep! We have chosen to turn a cold shoulder to the “cheap pork” route, as that is well done by others. We instead have chosen “gourmet pork” as our sights are set as high as our standards. What makes a pig gourmet? 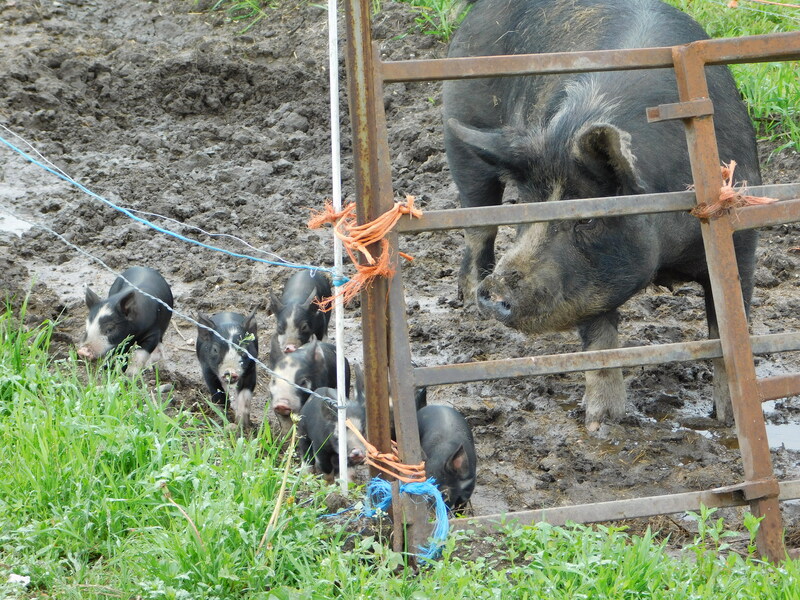 Around here, that includes a life with access to fresh air, a happy pig hut to rest in, and acres to do what pigs do best, but it also means a feed ration that is like few other. Nearly 99% of all US born hogs are fed CORN and SOY. Both known for causing inflammation. Another percentage feed waste products like brewers grain, leftovers from the ethanol making process, even restaurant and grocery store expired food. While those are ways to raise “cheap imput” pork, It doesn’t sit well with me that I have no idea where those ingredients came from. I’d rather have a pig fed virgin ingredients, than what I’d call ‘garbage’. So then, what DO we feed our pigs? While the recipe is balanced just right for our breeds of pigs, and our own program, the base of our feed is from transitional organic farms, who use no-till (non-tilled soil) and often as a nurse crop for other dual crop farming. These seeds of barley, field peas, flax, alfalfa, and other small grains come together with mineral specifically designed with pigs in mind. Other necessary micronutrients all part of the mix that balances the ration for each stage of the pigs life. Our breeding pigs have a little different needs than the young pigs, and slightly different than the finishing pigs, for example. While industrial farming has perfected raising pigs to get them in and out in the shortest time possible, we focus on a little slower growth to allow optimal flavor to develop. Our pigs are not treated with anything, no antibiotics or artificial hormones, nor have they had any shots in their life. Only very rarely has a pig ever become ill, so the need to treat them is quite rare. Rest assured, if one needs something, it will get it! Getting here wasn’t an over night win. We had many trials and errors, and had many consultations with other producers, vets, nutritionists, and google searches. We feel we have reached a happy place for our pigs, and the resulting pork is not only nutritious and delicious, but raised with as much love and integrity as our other livestock.